RIOULT Dance Center will officially open its doors to the Astoria community on Oct.4. Open houses will be held on Oct. 6 and 13. 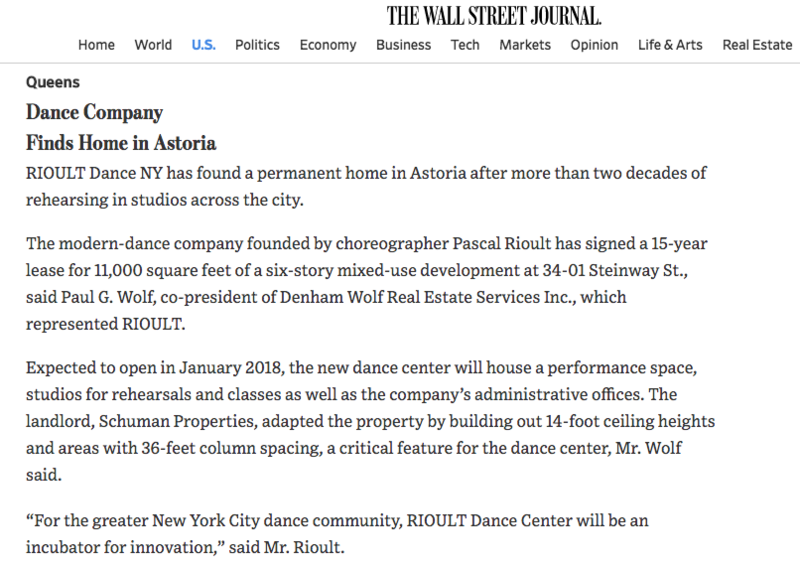 Last year, The Wall Street Journal reported that the 24-year-old RIOULT Dance NY would move from its location in Manhattan to Queens. The company’s founder, Pascal Rioult, signed a 15-year lease for the new 11,000-square-foot 34-01 Steinway St. location. According to Joyce Herring, associate artistic director of the RIOULT Dance NY, the open house is meant to allow Queens residents to get to know instructors and company members. But also, and more importantly, to allow for RIOULT to learn about the community so that future programing could enrich the lives of the center’s new neighbors. Open houses will consist of free dance classes for children and adults from 10 a.m. to 5 p.m. Classes will incorporate a variety of dance styles from the traditional ballet and jazz to Gyrokinesis, a movement method that addresses the entire body similar to yoga and pilates. During the open houses, company members will perform excepts from their repertoire and will afterwards greet and talk with visitors. The modern dance company was founded by Rioult, a French track-and-field star turned modern dancer, in 1994. Rioult was a principal — or highest ranking dancer — with the Martha Graham Dance Company before founding his own troupe. He developed a reputation as a leader in the neo-modern genre of dance. Since its creation, the dance company rehearsed and produced their dance season in temporary spaces in Manhattan, making the Astoria location their first permanent home. “We have long sought a permanent home for our professional company of dancers and we can now proudly offer the Queens and greater New York City arts communities a world-class dance facility and school performance, teaching and rehearsal,” said Hope Greenfield, chairman of the RIOULT Dance NY board of directors. For more information about classes open to the public and the school, visit www.rioult.org.